You have probably noticed by now that I really like to roast things, especially vegetables. This is because I love the way that vegetables taste when they are roasted rather than steamed. I used to shudder when my mother said that we were having glazed carrots. Gross. But then I tried roasted carrots, and cooked carrots no longer sounded unappealing. Delicately browned with a flavor similar to french fries, I find roasted vegetables hard to resist. I think you will, too. 2. Place the carrots in a large mixing bowl and toss with the oil and salt. 3. Arrange the carrots in a single layer on an unlined, rimmed baking sheet. 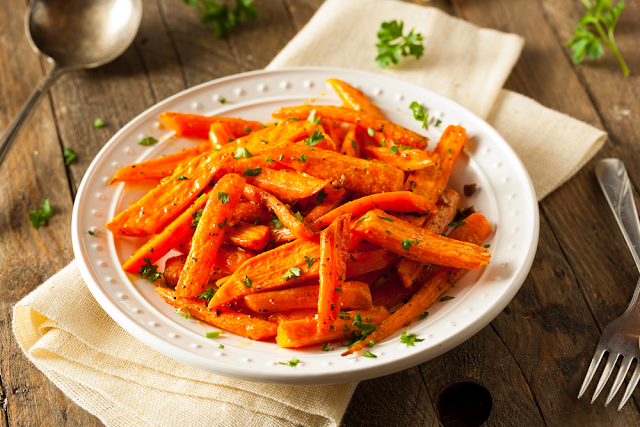 Place the baking sheet in the middle of the preheated oven and roast for 50 minutes or until the carrots are fork-tender, stirring them twice to ensure even cooking. Serve immediately. 4. Leftovers may be refrigerated in an airtight container for up to three days.